Mrs. Lori E. Kestner is proud to continue to serve as a member of the Marshall County Board of Education. Mrs. Kestner is presently employed as a Human Resource Officer for REM Community Options. She is a graduate of John Marshall High School and West Virginia Northern Community College. She and her husband John have three sons, Aaron, Eric and Brian and a daughter, Jessica. Jessica, and her husband Sam, have two sons, Taliby and Hasson, and reside in Columbus, OH. 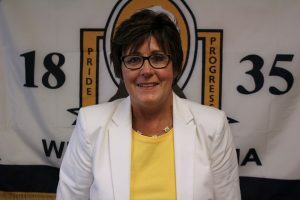 Mrs. Kestner's vision for Marshall County Schools is "Preparing and educating our children to live happy, successful lives in their home community. They will be our leaders."